In late April 2016, I had the privilege of spending a few weeks in Hawaii, observing on the NASA Infrared Telescope Facility, using a spectrograph called TEXES. This is an instrument that can measure the composition and structure of Jupiter’s clouds, and was built at the University of Texas, Austin. These observations provide a picture of how the weather systems change over time and will give us an idea of what the atmosphere was doing before and during the Juno mission to Jupiter. Since we are observing from Earth, the TEXES data will give us a global, broad scale, view of meteorology, whilst Juno spacecraft will perform close-up observations. Combining these has the potential of completely transform our understanding of Jupiter’s fierce weather systems. level. The NASA Infrared Telescope Facility is on the right. Observing on Mauna Kea is an incredible, other worldly, experience. 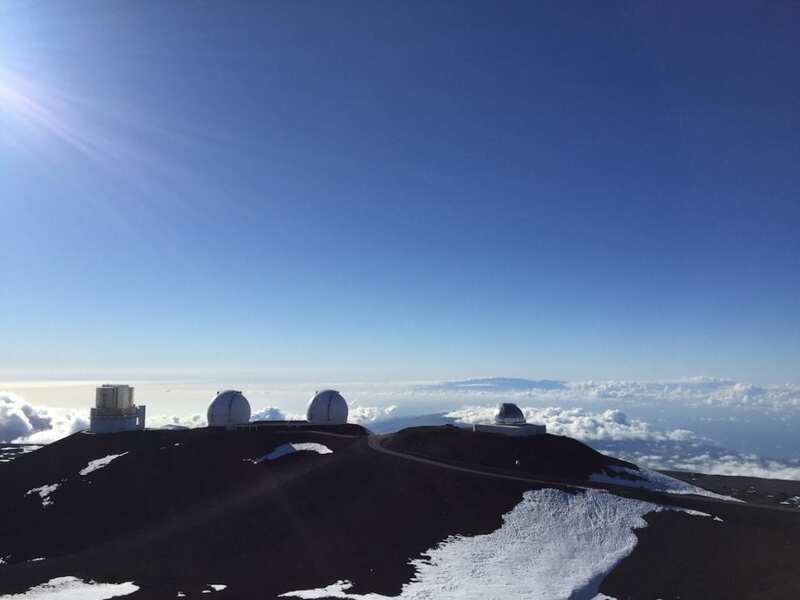 Hawaii is located in the tropics, but at 4,200 metres above sea level, where the telescope is, temperatures can be freezing and the wind is often blistering. It is strange packing winter gear when going to somewhere so balmy! The NASA Infrared Telescope Facility (the IRTF for short) is a 3 metre telescope that was built in the late 70s to support the Voyager spacecrafts mission to the giant planets. Since then it has proven to be a invaluable platform, and new instruments is keeping the telescope as relevant as ever. TEXES is a visiting instrument which means it is not always on the telescope, and is bolted to the back of it every time it gets used. At the end of our observing run, we were like a well-oiled Formula 1 pit-crew, unscrewing the instrument in record time! Because everything warm emits in the infrared the instrument needs to be kept very cold, and we filled it with liquid nitrogen every 12 hours, and liquid helium every 48 hours. We started observing Jupiter at 4pm each day – it is so bright, it can be seen with a telescope during daytime – and finished just after midnight. 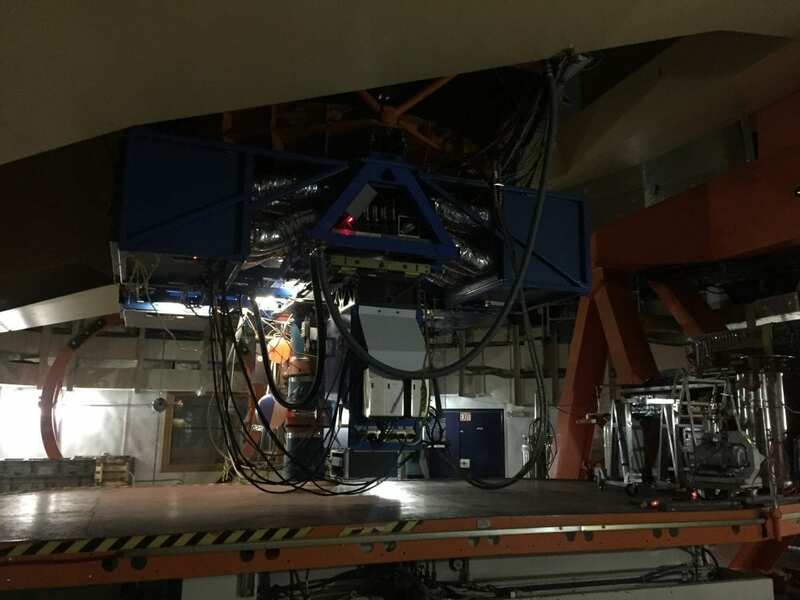 The actual observing is done in front of a computer, from where the instrument and telescope is controlled. Having hands on experience with the telescope and instrument was an amazing experience – science in real action! We were very lucky with the weather during our observing run, getting incredible data for each of the 13 nights we observed. A scan across the disk of Jupiter with the telescope takes about 6 minutes, and we do this for a number of wavelength settings. Each settings cover a different part of the mid-infrared spectrum, which means that we can sample different heights in Jupiter’s turbulent atmosphere. I am currently analysing the data, and it is looking really great!